It is now assumed that three dimensional cell cultures more accurately mimic the in vivo situation, thus attracting a fast growing interest of scientist toward these systems. As 2D cell cultures, 3D spheroids are more and more used in High Content Screening. 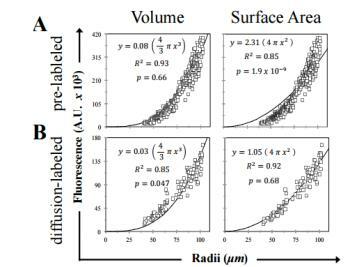 However, when using fluorescence microscopy, users have to keep in mind that 3D cell structures have a major influence on the measured fluorescence. Several factors can be taken into account, like the thickness of the imaged sample that will attenuate the fluorescence signal emitted, but also the capability of the dye to diffuse into the microtissue. Indeed, most of the hundreds of commercially available fluorescent dyes have been optimized for 2D cell cultures. Utilizing calcein-AM, a widely used dye, we investigated the most accurate method for quantification of fluorescence images of 3-D multicellular spheroids. Accurate normalization (using spheroid volume versus surface area) over a range of spheroid sizes depends on how the spheroids were labeled (prestained cells versus diffusion of dye into spheroid). Our method will help investigators avoid significant errors when using fluorescently labeled spheroids. Their report can be read at www.biotechniques.com.